"Our Father in Heaven knew that in mortality we would face challenges, tribulation, and turmoil; He knew we would wrestle with questions, disappointments, temptations, and weaknesses. To give us mortal strength and divine guidance, He provided the Holy Spirit, another name for the Holy Ghost. "The Holy Ghost binds us to the Lord. By divine assignment, He inspires, testifies, teaches, and prompts us to walk in the light of the Lord. We have the sacred responsibility to learn to recognize His influence in our lives and respond. "Remember the Lord’s promise: 'I will impart unto you of my Spirit, which shall enlighten your mind, which shall fill your soul with joy.' (D&C 11:13) I love that assurance. Joy that fills our souls brings with it an eternal perspective in contrast to day-to-day living. That joy comes as peace amidst hardship or heartache. It provides comfort and courage, unfolds the truths of the gospel, and expands our love for the Lord and all God’s children. Although the need for such blessings is so great, in many ways the world has forgotten and forsaken them." The role of Comforter as one of the assignments of the Holy Ghost is a precious one to me. 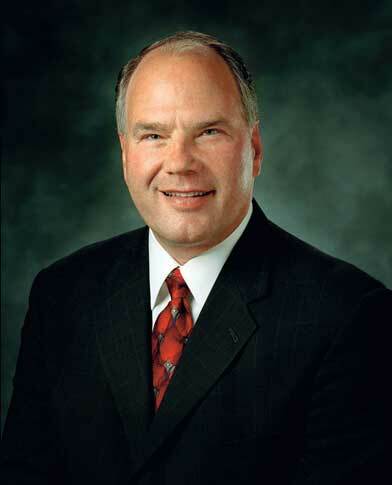 As Elder Rasband explains, we are all confronted with "challenges, tribulation, and turmoil" in this life and we often fact "questions, disappointments, temptations, and weaknesses." Through the gift of the Holy Spirit, we are able to find "mortal strength and divine guidance" to help confront and endure. 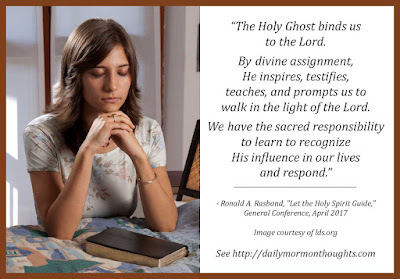 The simple statement that the Holy Ghost "binds us to the Lord" implies so much about our covenant life and the blessings that accompany discipleship. When we consider the sacred role of the Holy Ghost, how blessed we are to have the understanding of His role! The rest of Elder Rasband's address keys on the phrase from the sacramental prayers, that we "may always have His spirit to be with [us]." He suggests ways we can help facilitate that goal: living worthy of the Spirit, being willing to receive the Spirit when it comes to us, recognizing its promptings, and acting on the first promptings. Labels: challenges, comfort, covenants, Holy Ghost, joy, Rasband Ronald A.